Tracy Chevalier’s seventh novel arrives with enthusiastic endorsements on the back of the book jacket from Maggie O’Farrell, Rose Tremain and Joanne Harris. And she deserves the plaudits. Four years in the writing, the narrative has a confidence and measured pace that is the reward for the author’s immersion in her characters and subject matter. There are no fast cuts here, no sudden switches of chronology. It is 1850. A young Quaker woman, quaintly named Honor Bright, accompanies her sister Grace from their family home in Bristol to America. Grace is to be married to a Quaker draper who lives in Faithwell, a fledgling settlement in the middle of nowhere in Ohio. For Honor, the voyage is a nightmare of nausea and her sister dies of yellow fever when they reach their destination. Honor possesses nothing but a few quilts and her remarkable skills as a seamstress. But she is also blessed with a stillness, integrity and sense of justice that make her sound like a character from Bunyan’s Pilgrim’s Progress. Tracy Chevalier, however, is not intent to produce a Christian allegory. The Last Runaway is a quietly determined adventure story of an innocent abroad, discovering a new and very different country, the harsh realities of human behaviour, the nature of desire and despair. Honor’s first, critical encounter is with a man called Donovan, who hunts down runaway slaves for a living. Weathered, ruthless, cruel, he is the antithesis of any pale and reticent Quaker male she has ever encountered. There is something in the smell of his sweat that excites her, and something innocent in her that exerts a similar attraction for him. Her skill with a needle keeps her usefully occupied in a milliner’s house in Wellington, while she waits to be collected by Grace’s fiancé. The milliner, Belle Mills, is a doughty character, perhaps the best drawn in the book, whose commitment to the Underground Railway is a challenge to the savage mission of her brother, who turns out to be Donovan. Where Quentin Tarantino in his most recent film Django Unchained dramatizes the racial problems of the period with visceral abandon, only two shots ring out in The Last Runaway, the second with a devastating impact. 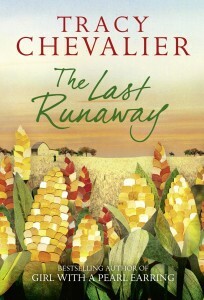 Tracy Chevalier’s fine novel manages to create tension with subtlety and an undeviating sense of purpose. Honor is no goody two shoes. She is constant in her beliefs, even when they bring her into conflict with those closest to her. The drama is in the detail. Chevalier describes the changing seasons with the same intensity with which she focuses on the making of a quilt or the pressures of principle, as well as the quest for emotional fulfilment, which involves more compromise and understanding than Honor possesses at the beginning of her journey. Chevalier took her degree at Oberlin College in Ohio. She knows intimately the physical geography of the area where she has set her novel, and conveys the deepest sympathy with the plight of the black slaves who risk their lives to escape to Canada or the Northern States. Without any flashy pyrotechnics, Tracy Chevalier demonstrates how traditional, linear narrative can still create a powerfully involving reading experience.